My basil plant has odd growths on the stems and I can't tell if it is a disease or caused by bugs. I don't know if the plant should or can be treated or thrown away. I also don't know if it's safe to eat the leaves, which currently look healthy. It appears to be Spindle Galls, though it is not something I have seen in Basil until now. 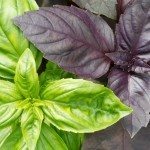 I personally would not eat the Basil and would discard the plant as to not spread this to other plants in the garden. Here is a link that explains this infestation.